No fewer than five persons died on Thursday during a stampede at the Jolly Nyame Stadium in Jalingo, the Taraba State capital during the presidential rally of the All Progressives Congress. An eyewitness, Tanko Yusuf, told one of our correspondents that the stampede happened as President Muhammadu Buhari was entering the stadium and the party’s supporters, who were locked outside, were trying to catch a glimpse of the President. Although the state Police Commissioner, Mr David Akinremi, and the Police Public Relations Officer of the Command, David Misal, did not respond to calls to their phones, the Public Relations Officer of the state Specialist Hospital, Mrs Dorcas Philemon, told journalists that five corpses were brought to the hospital. 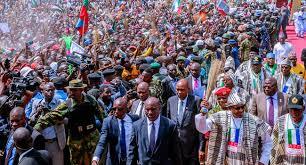 Buhari at the rally in Jalingo promised to complete the Mambilla hydropower project, if re-elected. “The Mambilla Power Project will bring development to your state and the country as it will generate enough electricity for you to do businesses and improve your living standard. I will complete it if you re-elect me for another term,” he said. Buhari said he would tackle poverty and make sure Taraba farmers had access to fertiliser at a subsidised rate. National Chairman of the APC, Mr Adams Oshiomhole, described Buhari as the only honest man among the presidential candidates and urged the people of Taraba to vote for him. The APC governorship candidate in the state, Sani Danladi, called on Taraba people to vote for Buhari on February 16. The President, according to a statement by his media aide, Garba Shehu, expressed sadness over the death of the APC supporters. President Buhari called for restraint on the part of his supporters to avoid such incidents at the campaign venues. “I want them to stay alive and witness the dividends of purposeful governance that the APC administration will unfold when they renew our mandate,” he said. Following the deaths, the All Progressives Congress, through its National Publicity Secretary, Mallam Lanre Issa-onilu, said it was deeply pained by the loss. The statement read, “Our great party is deeply pained by this painful loss. We pray for the dearly departed and express our deep condolences to their family members, loved ones and the good people of Taraba State. The party promised to ensure improved crowd control to avoid a recurrence. Responding to the tragedy, the presidential candidate of the Peoples Democratic Party, Atiku Abubakar, in a statement by his media aide, Paul Ibe, also said he was sad over the tragedy. Atiku also prayed for strength and comfort for the affected families and for God to grant the deceased eternal rest.